Following Time magazine's announcement, the Russian weekly Expert also named Vladimir Putin its Person of the Year, giving him credit for Russia's resurgence in global politics. Time magazine recently named Russian president Vladimir Putin its Person of the Year for his efforts at stabilizing his country. In Russia, the business weekly Expert gave Putin the same title, but for a different reason: Expert credited Putin with extending his influence far beyond Russia's geographical and political borders. In 2007, Putin most vividly revealed his skills as a policymaker: his readiness to take serious risks, his ability at backing a rival into a political corner with a mutually advantageous proposal and his willingness to act unilaterally. 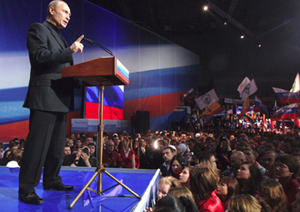 This drive caused many to doubt that Putin would abandon the Russian presidency in 2008. For many years, ordinary people and experts alike discussed how and when he would make his move to hold on to power. Even after first deputy Prime Minister Dmitry Medvedev received Putin's personal blessing to become the next president, not everyone was convinced. This was understandable for Russians, whose political history is dominated by Czars and General Secretaries who tried to hold on to power at all costs. In fact, Putin was trying to meet a more important challenge than simply maintaining his influence. In 2007, he made several fundamental decisions that would come to define Russia's future role as a country with European culture and a global influence. The first important step in this direction was Putin's Munich speech on February 10, 2007, in which he defined the pillars of Russia's new foreign policy. He told the West (the U.S. directly, and Europe indirectly) that a single country could not justifiably dictate its will to others, even with tacit agreement from the "silent majority." He argued that global stability was only possible if countries were ready to consider the interests of others when implementing their own political strategy. He also reaffirmed, citing instability all over the world, Russia's military-strategic potential. Before Munich, Putin had tried to compromise with the West. After Munich, the situation changed dramatically: Russian strategic aviation resumed long-distance patrolling of its air space, while the Russian navy went on several far-flung missions for the first time in many years. Putin continued this independent course during negotiations with the West over Kosovo, Iran, and North Korea. During the summer, Putin made a trip to Guatemala to attend a session of the International Olympic Committee. His efforts paid off: Russia's candidate city, Sochi, was chosen to host the 2014 Winter Olympics. It was a risky step, but Putin apparently decided that firm, if costly, international commitments would aid Russia's economic and social development. "Sochi 2014" was also a critical foreign policy gesture: what better way to advertise Russia's recent economic successes to the entire world? This is instrumental to assessing Putin's domestic policy. In his understanding, a state should, above all, play and win on the global political and economic market. As a former KGB officer, Putin warrants that foreign policy override everything else. He has also demonstrated his intention to use Russia's territory and resources to achieve this. Putin waited until the last minute to embark on "Operation Successor." This was not so much a program for the transfer of power, or even an attempt to consolidate his party in parliament. Its purpose was to strengthen Russia's economic position in the world arena. By carrying out the transfer of power suddenly and quickly, Putin accelerated the consolidation of strategic assets in all spheres vital to foreign policy positioning: during the summer, Putin set up the Unified Aircraft Corporation and the Unified Shipbuilding Corporation. In autumn, even more state corporations - Rostekhnologii (Russian Technologies) and Rosatom (the former Federal Atomic Energy Agency) - were created. In addition, Putin tried to preserve complete control over Russia's accumulated financial resources. The promotion of Finance Minister Alexei Kudrin, a liberal-minded politician famous for his devotion to building up state reserves of gold and foreign currency, to the post of First Deputy Prime Minister was a sign of Putin's sound commitment to using the state budget for economic development in accordance with his geopolitical ambitions. Nobody can be absolutely certain that Putin will become prime minister if Medvedev is elected president. As Putin said recently, he is not even sure of this himself. Nobody can guess whether Putin would like to become Russia's president one more time. Some experts believe that Putin will occupy a key position in international politics. But it is already clear that, regardless of the political post he occupies, Putin will continue working to promote Russia's influence in the global economic and political system.